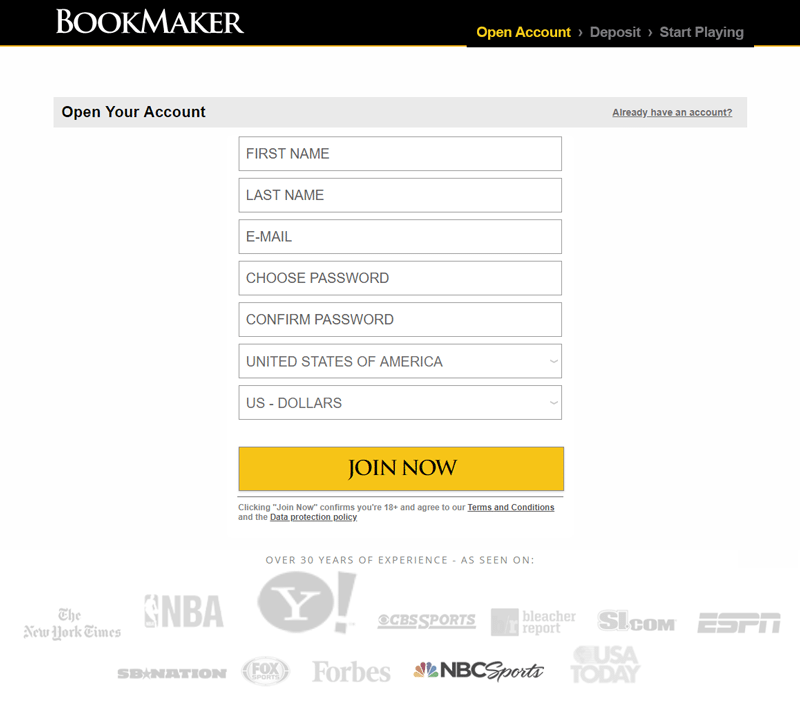 When you sign up at BookMaker you can receive up to $1,600 in cash bonus. Bookmaker’s Welcome Bonus gives you two options to earn cash back. 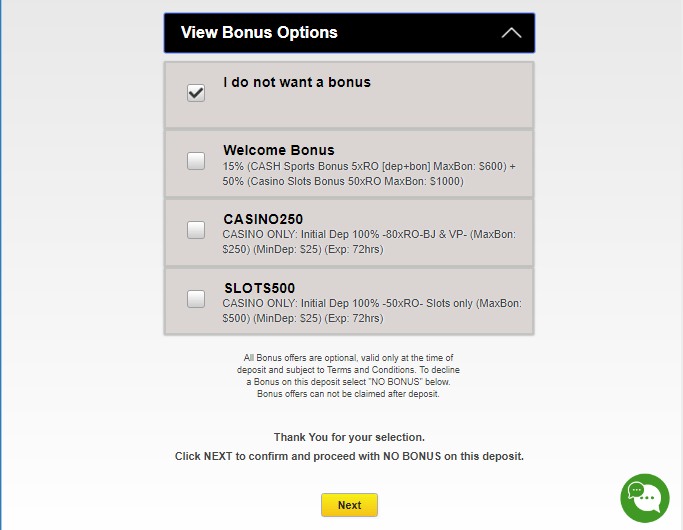 By selecting the Welcome Bonus, you get a 15% sportsbook bonus (up to $600) and an optional 50% casino bonus (up to $1000). The Sports Welcome Bonus has a 5x rollover (deposit amount + bonus) before you can request a payout. Casino bonus has a 40x rollover (on the deposit amount + bonus). Remember the casino bonus is optional, so if you select the Welcome Bonus, the sports bonus rollover requirement must be met. If you prefer to not to worry about the rollover requirement, select “I do not want a bonus” from the options. To get either of the two Welcome Bonuses you need to be a new customer when you make your initial deposit. There are no restrictions to the deposit method to claim the reward. 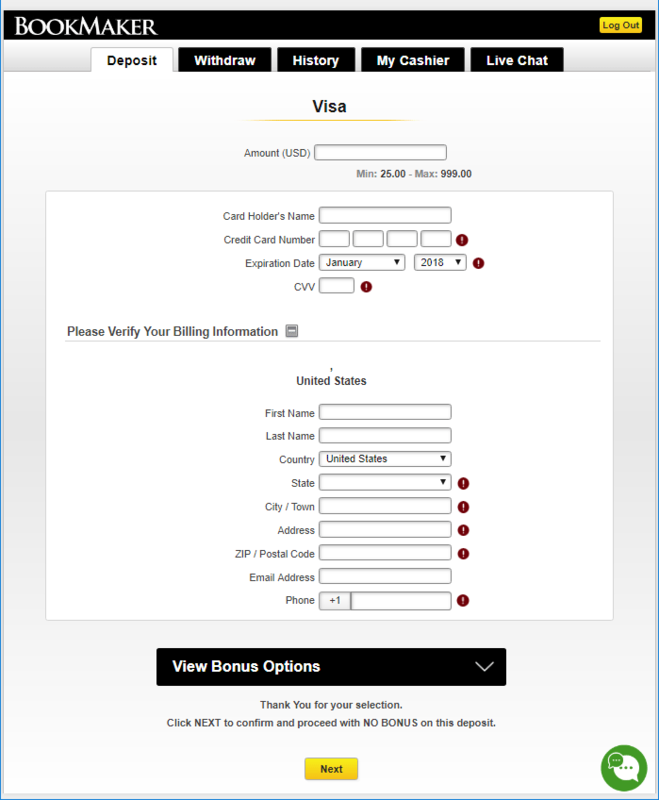 You also must select the bonus you want from bonus drop down before submitting your payment, as bonuses can not be credited to your account retroactively. When you reload your account you get a 25% cash bonus when you fund your account using bitcoin or any cryptocurrency. This bonus is good up $1,000. There is also an 8x rollover requirement (deposit amount + bonus) before you can withdraw from your account. Just a reminder you must use bitcoin or any cryptocurrency to fund your account, with a $100 minimum deposit, to be eligible for the bonus. The table below compares the Cryptocurrency Reload Bonus to the other Reload Bonuses that BookMaker offers. The good thing about the Crypto Reload is that you can be any BetPoint Member Level to redeem the offer. For Crypto Reloads, the minimum deposit is only $100, with a 8x rollover, compared to other reload bonuses that have a minimum deposit of $300, with rollovers starting at 4x. You can read more about the BetPoint Reload Bonuses in the following section. 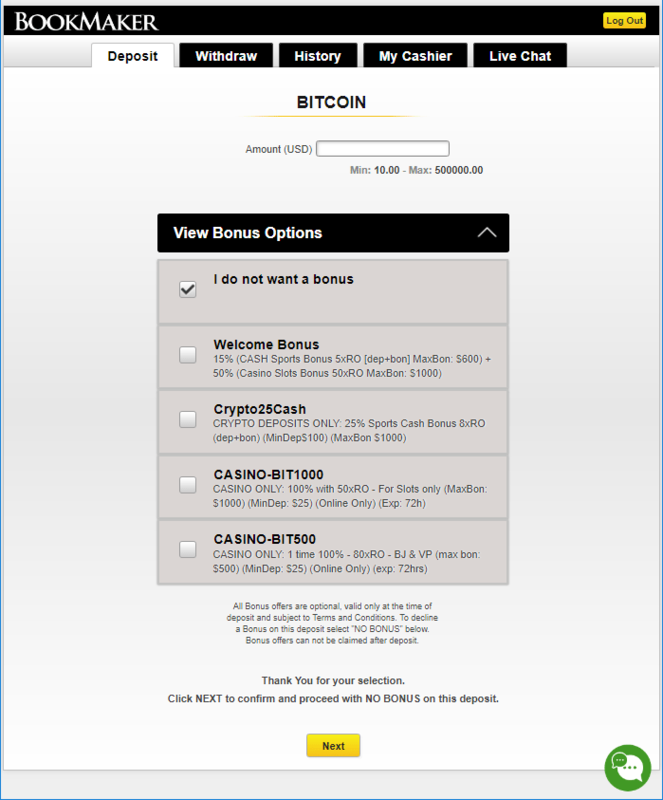 To claim your bonus during your cryptocurrency deposit, you must select your choices from the dropdown. You also have the option, to not select the bonus if you prefer to not deal with the rollover requirements. BetPoints reload bonuses, also listed under the SportsBook promotion section, are based on your BetPoint membership level: Gold, Platinum and Diamond. (To see more details about how to qualify for the different BetPoint Levels, skip to the following section). For Gold Level Members, everytime you reload you can get a 10% cash bonus, up to $400. This bonus comes with a 4x rollover requirement. If you reload your account with $100 and get a $10 bonus for your Gold Reload Bonus, your rollover requirement is $440 (=4x ($100+$10)), before you can withdraw. For Platinum Level Members, everytime you reload you can get a 15% cash bonus, up to $600. This bonus comes with a 5x rollover requirement. If you reload your account with $100 and get a $15 bonus for your Platinum Reload Bonus, your rollover requirement is $575 (=5x ($100+$15)), before you can withdraw. For Diamond Level Members, everytime you reload you can get a 20% cash bonus, up to $800. This bonus comes with a 5x rollover requirement. If you reload your account with $100 and get a $20 bonus for your Diamond Reload Bonus, your rollover requirement is $600 (=5x ($100+$20)), before you can withdraw. Gold, Platinum and Diamond Reload Bonuses have other conditions besides the rollover requirement explained in the sections above. Bonus offers cannot be combined with other offers/promotions. You can use any deposit method you prefer to receive the bonus. The bonus will be in cash, once your meet the rollover requirement. Remember all bonuses are optional, if you do not wish to deal with the rollover requirement, select no option before you checkout. But if you choose to claim the bonus, you must claim it in the bonus drop down before you submit your deposit, as it cannot be claimed afterwards. 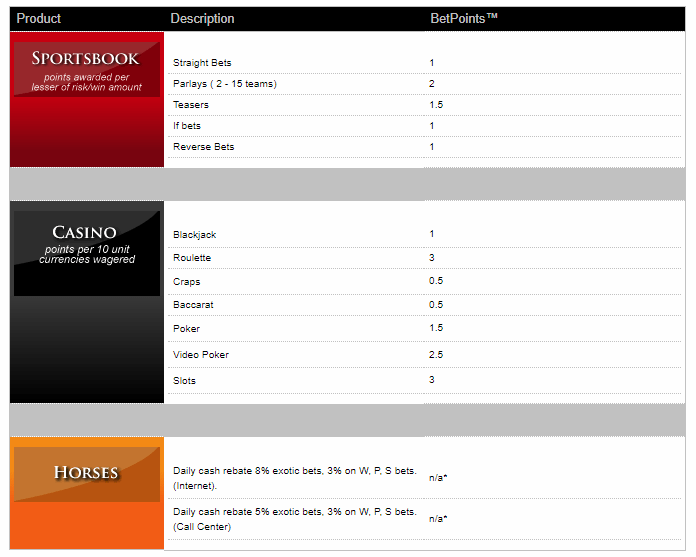 The BetPoints is a loyalty rewards program is based on the amount you play. You earn points for all wagers you make in the sportsbook or casino. The more you play the better the rewards. Gold Membership is for those with 0-29,999 BetPoints. Platinum Membership is for those with those with 30,000-299,99 BetPoints. Diamond Membership is for those with 300,000. Below we will explain the benefits in each of the 3 tiers. All points must be earned in 12 month period to qualify for these levels. Your level is based on what you earn, not your balance, so you can redeem your points at anytime without affecting your level. 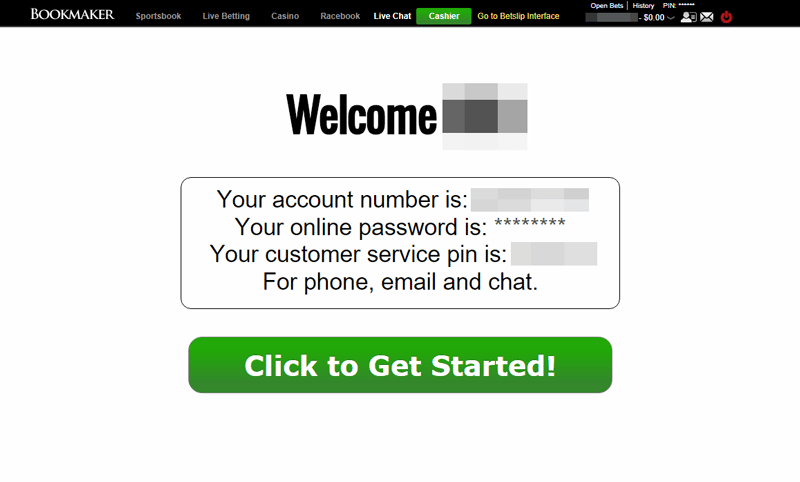 Once you create an account on BookMakers, you automatically are entered into BetPoints Program. You will begin earning points from your first wager, as long as it is in the sportsbook, casino or poker. Your points are updated daily at 12:00am Midnight PST. If you are logged in, you can see your current points at the top of the page when you click “Use My BetPoints.” If you want to see your membership level, just roll your mouse over your account number. To clarify, moneyline wagers on NFL, NBA, NCAA football and basketball DO NOT earn you BetPoints. Wagers on office Pools and contests are also excluded from earning BetPoints. If you are inactive, no wagers or deposits, for 8 months you will drop 1 level in membership. If you are inactive for 12 months, your points will be zeroed out. Gold Level Member receive a 10% cash deposit bonus for every reload of $300 or more. Just to note there is a 4x rollover) and you can claim up to $400. As a bonus for being in Gold Level Membership, you get free daily crypto payouts. You also receive 1 free debit card payout per month, or 30 day period, if it is over $300. Platinum Level Member receive a 15% cash deposit bonus for every reload of $300 or more. Just to note there is a 5x rollover) and you can claim up to $600. As a bonus for being in Platinum Level Membership, you get free daily crypto payouts. You also receive 1 free debit card payout per month, or 30 day period, if it is over $300. The main difference between Gold and Platinum membership is that your earn BetPoints at 10% higher rate. Diamond Level Member receive a 20% cash deposit bonus for every reload of $300 or more. Just to note there is a 5x rollover) and you can claim up to $800. As a bonus for being in Diamond Level Membership, you get free daily crypto payouts. You also receive 2 free debit card payout per month, or 30 day period, if it is over $300. You also get access to a dedicated VIP customer service representative 24/7. The main difference between Platinum and Gold membership is that your earn BetPoints at 10% higher rate. There are various ways to earn BetPoints. The chart below goes into details for the different types of wagers in the Sportsbook, Casino and Horses. Once you earn your BetPoints you can redeem them as soon as you like. And it’s up to you how to use. The more you play, the faster you earn points. The more points you earn the higher you membership level, increasing your cash payout. If you are Gold Member and you had 1,000 BEtPoints you could redeem that for $4.75, but if you were a Diamond member, you redeem the same amount of points for $5.85. 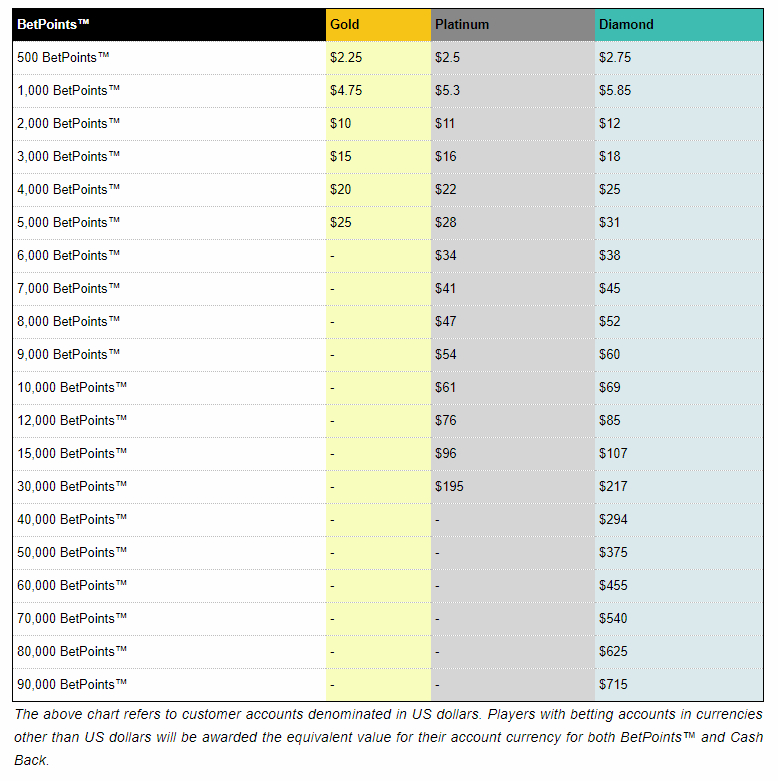 Refer to the chart below to see the exact payout for BetPoints at each level. Once submitted, you will see the welcome page. You are now ready to start earning your Welcome Bonus. Adding money to you account is easy. When you click on the deposit tab, at the top of the page, you will go to a screen that gives your 4 choices: Visa Credit Card, MasterCard Credit Card, Bitcoin and Other Cryptocurrency. For credit cards (Visa and MasterCard), all you need to enter is your credit card info: Name on the card, Card Number, Expiration Date and CVV. You will also need to provide your billing info for that credit card: First Name, Last Name, Country, State, City, Address, Zip Code, Email and Phone Number. Just a note, credit card deposits have a minimum of $25 and a max of $999. Don’t forget, on this page you will also have the option to choose Bonuses before submitting your deposit payment. For Bitcoin and other Cryptocurrency, you need to enter a minimum of $10 to a maximum of $500,000. If you choose to opt into a bonus, make sure to select it before continuing with your cryptocurrency payment. 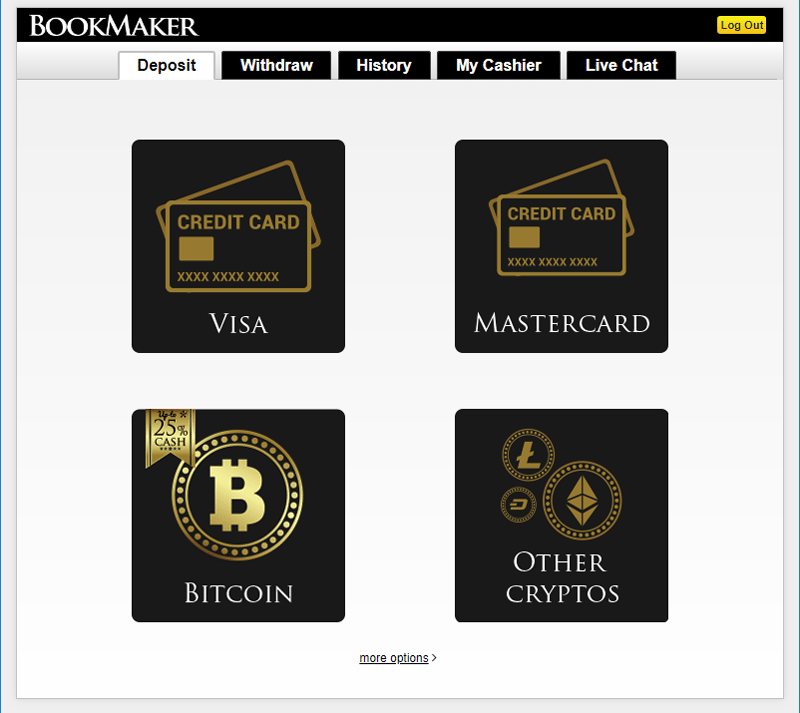 Join BookMaker now and starting winning! Like this and found it just in time for playoffs and the SuperBowl! Not the biggest welcome bonus, but that's actually good because then you don't get stuck try to pay it off! Straightforward and easy to use website. Would recommend it, thanks.